A Normande Cow grazing in the fields. 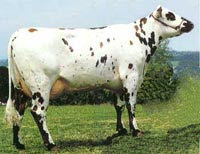 The Normany cattle breed comes from North Western France, is dual purpose but is noted for its dairy. 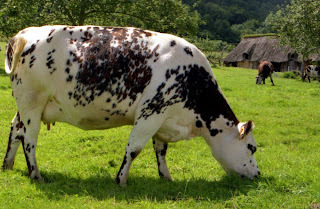 The Normande or Normandy Cow is a breed that orginated in the north west region of France. It is a dual purpose breed, but is noted for its fine dairy production. Guernsey Cattle, grazing in the fields of the British Channel Island of Guernsey. As its name suggests, the Guernsey breed of cattle orginated in the British Channel Island of Guernsey over 300 years ago. It is primarily used for dairy.